Vijay Mallya: When the race started and all cars exited the first corner, I was happy to see that both my cars were on the track and there was no incident with them, which made me feel very relieved. I knew that our cars were strong, and the race pace was good and that made me very optimistic that both would finish in the top ten and in the points. I was very, very disappointed when I heard on the team radio that Adrian’s engine had lost power, which is very unusual for Mercedes. But then these things happen in Formula One and in racing. It was very disappointing when Adrian had to retire, as he was going really well. Like in the last race, Tonio drove brilliantly, even though his tyres were considerably worn out, but he held on. He would not let anybody pass him, particularly Rubens (Barrichello) who had a set of new tyres. And once again I think he drove a great race, and finished seventh with six more points for the team, which is a great feeling, to be regularly in the points. VM: Adrian is a very quick and great driver, so it must be a matter of karma – there is no other explanation. He – and Tonio – was quite capable of finishing this race, and finishing in a better position than he had started from, so this was just unfortunate. As we believe in karma in India, I have to do something about this. Q: You have said that you will use third driver Paul di Resta more after his successful Friday outing in Melbourne. How will this happen? VM: We’ll use him in Friday practice, so he gets to drive a Formula One car at various race tracks and gets to know them. This is our way to prepare him properly and this is exactly how our team works – to give everybody the best chance. We are a small and well-knit team, we all cooperate with each other and do everything in the team spirit. And this is just one example of team spirit, when both Adrian and Tonio are happy to give up one session of practice to let Paul have a drive. Q: What does the departure of former technical chief James Key mean for the team? VM: In this sport it would be unwise to say that a team’s performance only depends on one individual. James is top class and he contributed a lot. He left us for better prospects. But we have a very strong team in-house, and we have supplemented this team even more. These guys are continuing to develop the car even more and making it more and more competitive. I said that we would score points in 2009, and we did score 13 points – and also a pole position together with a podium finish plus a fastest lap. Now in 2010 I’ve said that we should regularly score points and we have achieved that objective so far, scoring points at both races. So I am quite happy about that and hopefully we will have both cars scoring these regular points. Q: You once said that 2009 was Force India’s first real season, where you have achieved your objectives. It looks like 2010 could be even stronger. What does this mean in terms of the fan base back in India? VM: It is huge, because a lot of fans in India already supported Force India when it was still Spyker because they knew that I had bought the team. But you are right, 2008 can be written off as far as I am concerned because we inherited the Spyker car and team. There was no real contribution from our side. 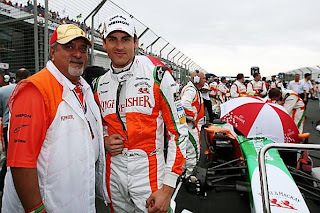 But 2009 was the first real year for Force India, where you have seen that we performed the plan. In 2010 I think we have got off to a good start, and we are also performing the plan so far. Q: There have been many discussions about the current race format, whether it supports excitement or not. If you could dream up an ideal format, what would it look like? VM: What people are basically commenting about is the predictability of the race result. You can’t really hope that there is a race incident, a safety car phase or a yellow flag. The challenge is to make it interesting without these things happening. And that I guess was the reason why the FIA has changed realistic technical regulations. But clearly in the last two races we have not really seen that excitement of overtaking. But let’s see as the season progresses. Q: What are your personal hopes for the end of this season, knowing that in 2011 there might be an Indian Grand Prix? VM: As per plan means that we score regular points, maybe a few podiums along the way, and become definite podium contenders for 2011. And as I understand it the Indian Grand Prix will be at the back end of next season, which should give us plenty of time – and there I want us to be on the podium. Q: Is Formula One racing more enjoyable for you with regular good results? VM: Obviously yes, as I don’t have to walk so far down the grid to get to my cars. It is definitely rewarding and satisfying when the team is doing well, as there are other very competitive teams out there. To finish well into the points and in the top ten really makes a difference. Considering that we have a small head count – and small budget – we are already on the heels of the big teams. I have always said that money cannot buy performance. I am very sure that we have one of the smallest budgets of any Formula One team, and I am really proud that we show so much performance.